It may seem a bit odd that a B&W silent film titled The Artist (one of my favorite films of the year) about Hollywood's silent film era was actually written & directed by a French filmmaker. Not only that, but it stars two incredible French actors - Jean Dujardin and Bérénice Bejo. After seeing the film, initially at the Cannes Film Festival and again at the Telluride Film Festival, I've come to recognize it's a story where the language (including the filmmaker's) doesn't matter, and that's part of its brilliance. I met writer & director Michel Hazanavicius in Telluride to ask him nearly everything I could about making one of my favorites of 2011. If you haven't taken an interest in The Artist yet, I highly suggest you do. Watch the official US trailer here and catch it in theaters starting later this November/December, being released by The Weinstein Company. This was filmed outside in Telluride, one of the most beautiful film festivals in the world, on my Flipcam. There's a point where the wind picks up, so I did my best to process the audio and clean it up so you could hear him better. As I've said many, many times before, I loved The Artist and even saw it a second time so I was fresh with questions. I wanted to ask Michel about the original idea, how he even conceived of creating a black & white silent film in this modern era, how it all came together, and the challenges of shooting a film without any dialogue, yet conveying emotions and telling a wonderful story. Michel did a fantastic job of answering everything I had to ask and the interview turned out great in the end - I hope you enjoy watching! When I refer to Penelope a few times, it's Penelope Ann Miller, who appears in the film, but was also in Telluride. I spoke with her a few times during the fest about working on this. 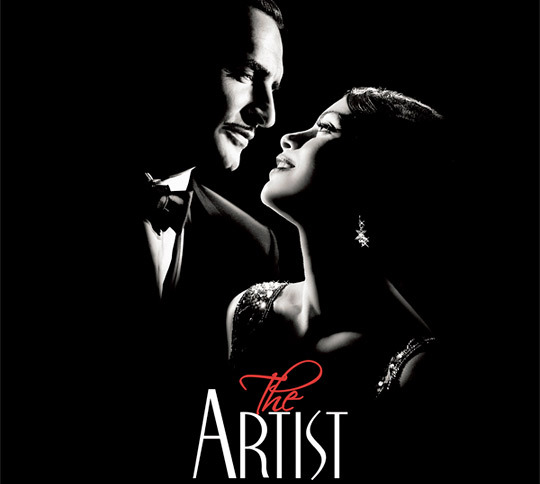 The Weinstein Company will be releasing The Artist in limited theaters starting November 23rd, Thanksgiving week, this fall. Go see it! Thanks for the interview, but why is it odd that one of your favorite films of the year is written & directed by a French filmmaker? That's not what I was saying... I'm saying it may seem a bit odd that a film about Hollywood's silent era, in English, is made by French filmmaking team. Mainly as an intro to those that don't know much about this film yet. No worries. Hope you enjoyed the interview and I really really hope you're planning to see this! I agree with the praise... this is a very entertaining film with a brilliant performance by lead actor Dujardin. Anyone who has had their fill of all the 3D trash these days, should see this to remind them why they actually loved movies in the first place! I think this was a great interview and sent it to an Emmy winning friend. I helped fund raise for the next project and we got a kick out of @14:30 with MH's BS "hoping it would be the truth." I posted some of this elsewhere on your site, but since you enjoyed this era of film so much, see 1928 'Our Dancing Daughters' with a very young Joan Crawford, jazz age Flappers, dazzling in sets (Cedric Gibbons) and costumes(Adrian) [both of these two were just getting started in this film]. Anything Harold Lloyd to find out why he was more popular than Chaplin or Keaton at the time (much more current to the times then, ie Prohibition). Just for quirky' 'Man of the Century,' 1999, is witty about a guy who lives in the 20s, but it is the 90s, excellent sets, and 20s lexicon. I'm sure you've seen BB Thornton's, "The Man Who Wasn't There," shot is crisp black & white. For best B&W lighting of all time, I go with 'The Mummy,' 1932.